Marilyn Lerch's latest book of poetry draws on a strong sense of place and an appreciation of the community, culture, and landscape of Sackville. 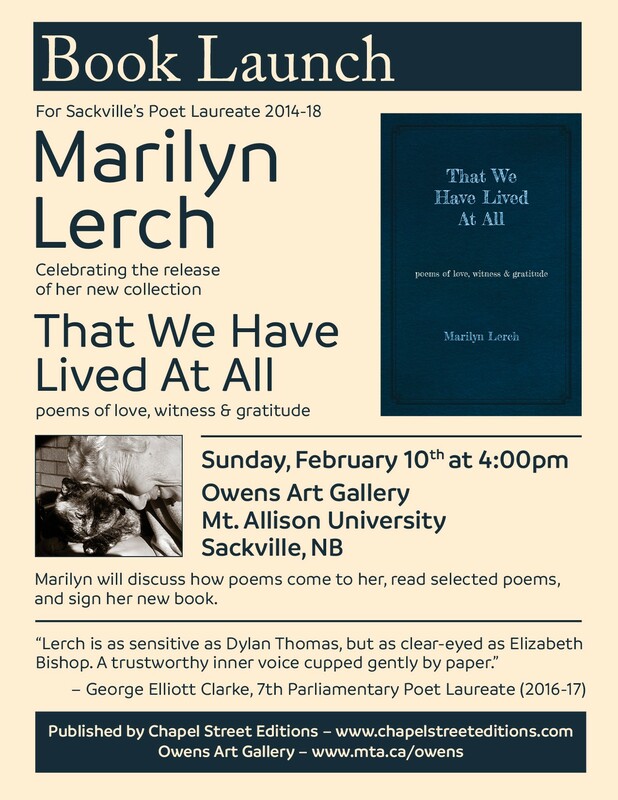 Lerch, former Poet Laureate of Sackville, will launch That We Have Lived at All: Poems of Love, Witness & Gratitude, on Sunday, Feb. 10 at 4 p.m. in the Owens Art Gallery. The book includes poems that gather up her deep engagement with the human condition and the mounting crisis of modern civilization. Two long poems of dramatic power — “Recycling Samuel Beckett” and “Foremothers” — are different in theme and style but have been composed out of long reflection on the human struggle and a deep sense of solidarity, love, and gratitude, notes Keith Helmuth of Chapel Street Editions, which published That We Have Lived at All. Marilyn Lerch is the author of four previous volumes of poetry and was president of the Writers’ Federation of New Brunswick from 2006 to 2010. She worked for 24 years as a public school teacher and has long been active in cultural movements devoted to social justice and environmental protection. The author’s presentation at the Owens Art Gallery event will include her reflections on the context in which this new book was created and on the perennial urgency of lifting up the beauty and goodness of the world, says Helmuth, who adds there will be time for questions and comments from the audience, and Tidewater Books will be present with copies of That We Have Live at All.